If you prefer to use eggs, for dairy-free, but not vegan vanilla cupcakes, 2 eggs can be substituted for the flaxseed and water. In a food processor mix ground flax seed and water until the mix becomes viscous and 'egg-like' to create flax 'eggs'. In a large mixing bowl cream together margarine and sugar. Add flax eggs and vanilla and mix well. In a separate bowl combine flour, baking powder and salt. Add flour mixture and milk/yogurt mixture in batches, starting and ending with flour. 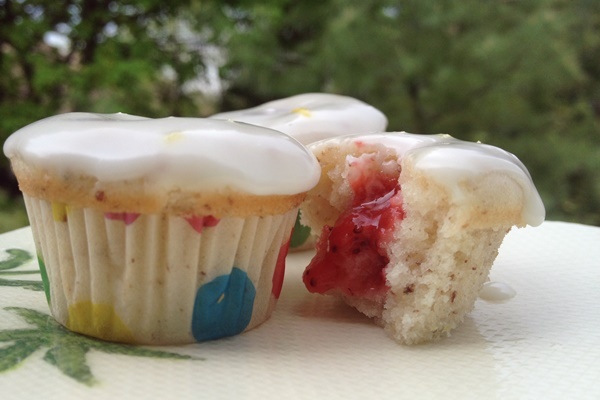 Spoon batter into mini or regular cupcake tins with liners. Bake for 12-15 minutes for minis or 18-22 minutes for regular or until a toothpick inserted into center comes out clean. Heat strawberries and sugar over medium heat, whisking while cooking to further break up the strawberries. Cook for approximately 10 minutes. Set aside to cool. Mix all ingredients for the glaze in a bowl and set aside. Once cupcakes and filling have cooled, spoon the filling into a piping bag with a round piping tip. Insert the tip into center of cupcake and squeeze some filling into the middle. Repeat until all cupcakes are filled. Dip the top of cupcakes into the glaze or spoon the glaze over them. Enjoy!